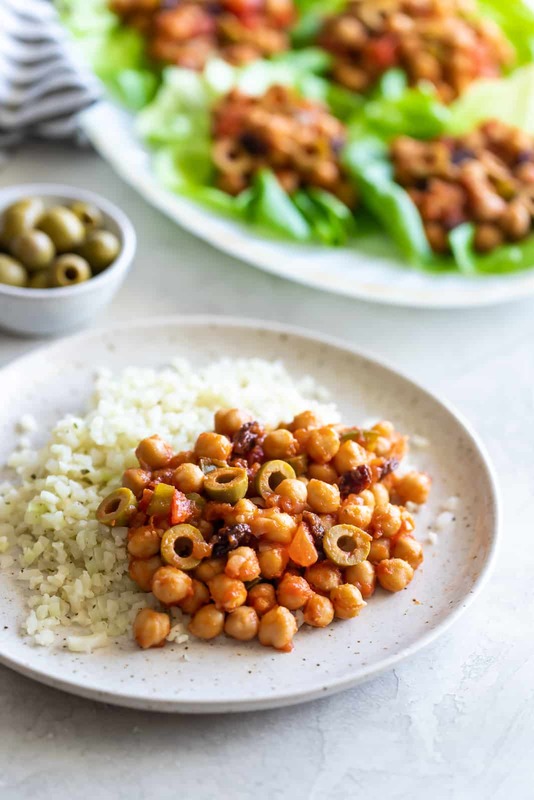 This chickpea vegan picadillo is a plant-based meal made Cuban-style with spices, onions, garlic, tomatoes, olives and raisins. A quick weeknight dinner! There’s no question that I love me some Cuban food. I mean, I am Cuban after all. 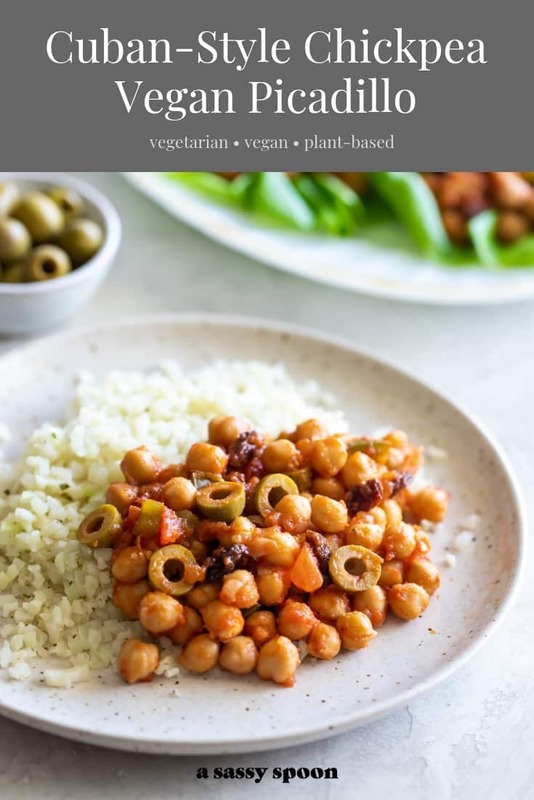 Picadillo has always been a staple in my life so with that in mind, I wanted to find a plant-based alternative for vegetarians/vegans to enjoy the same great flavors I did growing up. In case you don’t know, picadillo [pee-ca-dee-yo] is a classic Cuban dish made with ground beef, tomato sauce, raisins, olives, and spices, usually served over white rice. And honestly, it’s the easiest dish to make on a weeknight. 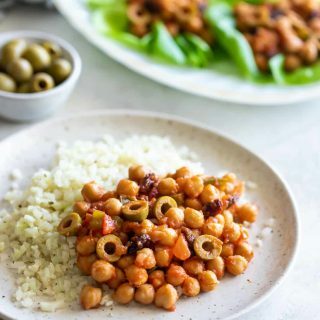 This vegan picadillo is made with chickpeas and it is DELISH. I’ve also made a lentil version in the past but I think this one is just as delicious. Bringing this dish to life is not as hard as it sounds at all. A lot of people are intimidated when exploring different cuisines in the kitchen. Don’t worry! Here’s how easy it is to make this dish. In a skillet, you add a bit of oil and sauté onions, garlic, and green peppers. This is the trifecta in Cuban cooking and it’s called sofrito. These three ingredients are the foundation for most Cuban dishes. Once those three ingredients have sautéed for about 5 minutes, you can add the rest of the ingredients. Chickpeas, tomato sauce, chopped tomato, cumin, oregano, salt, and pepper. Stir everything together and simmer for another 8-10. Taste and adjust as needed. 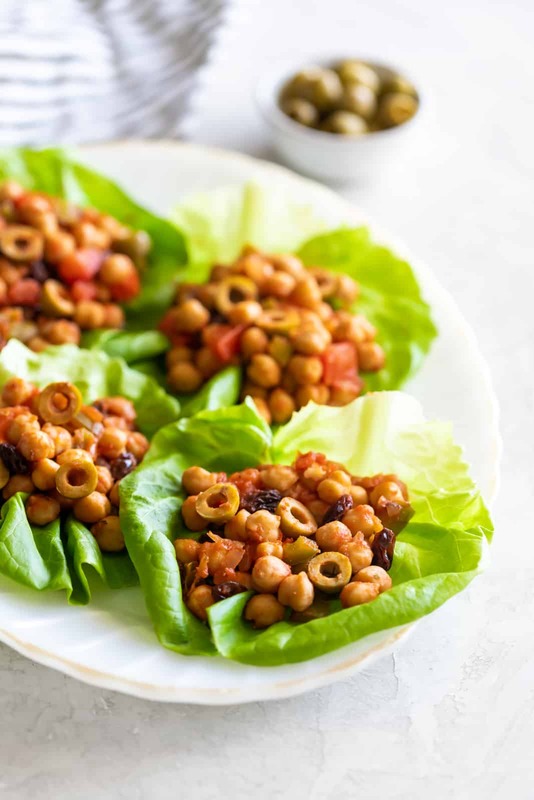 You can serve this vegan picadillo on lettuce wraps or over rice. Also, you can totally serve it with avocado or plantains. Sweet plantains with this dish is never a bad idea. I hope you love this dish as much as I do! In a skillet, sauté onion, garlic, and green pepper at medium heat until fragrant, about 5 minutes. Add chickpeas, tomato sauce, chopped tomato, cumin, oregano, salt, and pepper. Stir to combine. Bring to a simmer and cook until the sauce thickens, about 8-10 minutes, stirring occasionally. 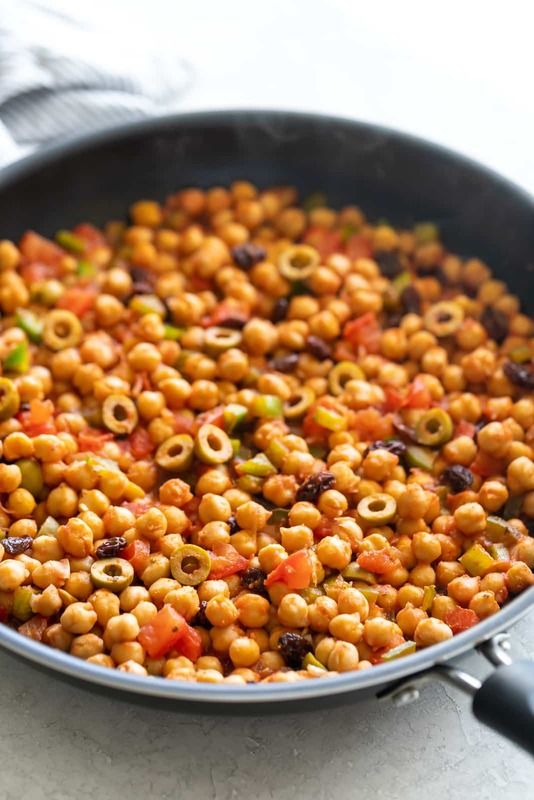 Remove from heat and stir in olives and raisins. Serve with rice or on lettuce wraps. Enjoy!